What? You thought Dodge was done upgrading the Challenger? Just because Dodge launched its insane Challenger Demon for 2018 doesn't mean it’s done with the Challenger program as a whole. According to , Dodge is busy prepping a Drag Pack option for the 2019 Challenger Hellcat. 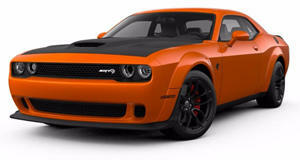 Supposedly, this package will feature the standard – not wide – Challenger body but will have the Demon’s Air Grabber hood. If the rumors prove to be correct, then the Challenger Hellcat Drag Pack will have roughly 75 percent of the Demon’s content. A horsepower increase is also expected, from 707 hp to around 725 hp. Aside from the Air Grabber, other potential Demon items that could be carried over are its unique Nitto tires, the Torque Reserve function and TransBrake. Dodge likely does not want the Hellcat’s price to increase all that much for this particular option pack, but since , why not utilize them further and get a greater return on the initial investment? Makes sense to us. further speculates a “Drag Mode” option within the UConnect system will also be on hand, as well as a taller final drive ratio. Dodge has yet to confirm anything regarding this subject just yet, but we wouldn’t be surprised to hear an announcement fairly soon, say at the New York Auto Show late next month. As for the Challenger’s and, for that matter, the Charger's, remaining years on the market? Well, we previously heard both will stick around for another few years, say till around 2021, before replacements arrive. It would make sense, considering the massive investment FCA made, for the .